Creating a 21st century pawnbroker - an alternative way to borrow money on the high street. 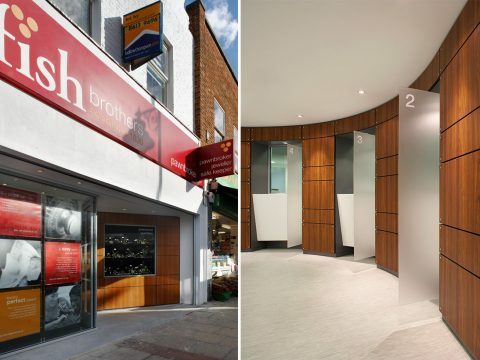 Fish Brothers are changing the face of pawnbroking, making it a more acceptable and familiar way to borrow money on the high street. We were commissioned to create a new brand identity and retail concept to transform the network of existing stores and roll out to new sites. The striking new environment provides comfort and accessibility together with the highest levels of physical and electronic security. The design is based on a sinuous timber panelled secure wall which runs through the centre of the space and flows outside to form the exterior frontage. The wall provides both standing and wheelchair accessible counters, promotional display and jewellery cabinets, and incorporates bulletproof linings, glazing and doors with biometric access control.